Holiday cheer in a catalog! These 4 exclusive designs make it a very fun way to give gifts. One design is as cheerful as the next! Hangtags included. 8" x 10" x 4". 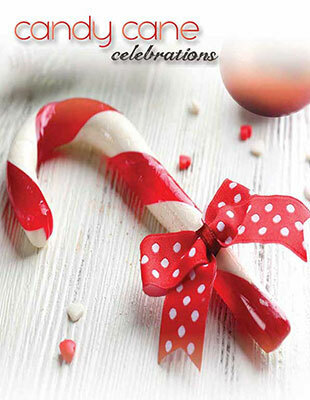 A holiday favorite... the sweet fragrance of candy canes! Our candle was is a unique soy blend, designed to retain fragrance and burn cleaner. Burn time 85 - 100 hours. 32 Sq. Ft. (24" x 16'). Made in the U.S.A.
32 Sq. Ft. (24" x 16') Made in the U.S.A.
Free paper cutter with every double roll! These festive characters adorn your gift tags in a handy dispenser box to make your gifts complete. 100 self stick labels. Lovingly designed by Suzanne Nicoll, these Holly Jolly gift bags will brighten the season! Gift tags included. Set of 4. 8" x 10" size bags. This very jolly elf is ready to display your special message on his chalkboard! 18" T x 8.5" W.